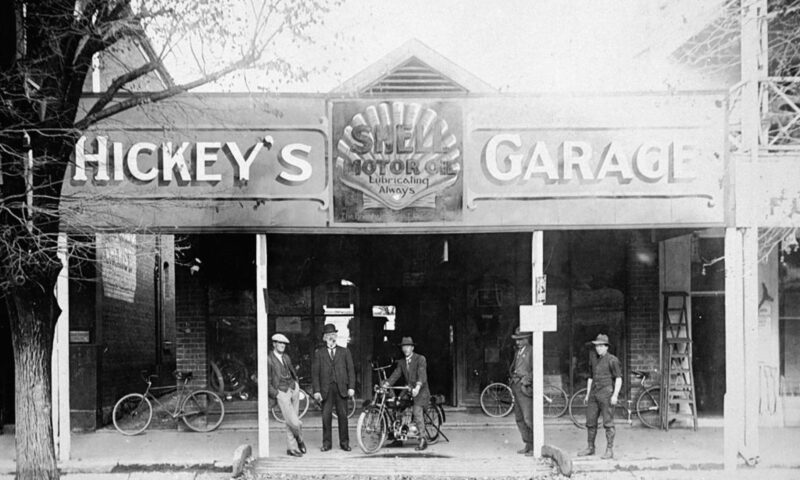 The lovely image below is of Hickey’s Garage in Murphy Street and was taken in 1923. The photo was taken from a negative donated to Museum Victoria in 1988 by M. B. Porter as part of The Biggest Family Album in Australia project to preserve the images that ordinary people had in their collections. M. B. Porter was probably Max Bernard Porter (1912-1989), a son of William Porter (c1867-1947) and Annette Maud Simmons (1877-1960). Max was a motor mechanic, as was his older brother William Farquaharson Porter (1905-1991). Four of the men were identified and I wonder if the young man on the right was not recorded as he was known to whoever wrote the names, and perhaps he was the writer himself. Max Porter was too young to be the man on the right, but his brother William would have been 18 years old and seems a good candidate, given the provenance of the image. Hickey’s Garage, c1923, unknown photographer, donated by M B Porter in 1988 to the collection of Museum Victoria. The men were identified as W. Hickey, J. Hickey, J. Deaz, and W. McGuire. W. Hickey was probably William Thomas Hickey who was born in 1880 and was recorded on electoral rolls in 1922 as an ‘agent’, living in Rowan Street. The dapper man in the cap and highly polished shoes leaning on the veranda post seems to be about the right age to be William Hickey. William Hickey’s father was John Hickey who died in 1935 aged 82, so would have been aged around 70 years at the time this photo was taken so is likely to be the older gentleman. John was also recorded in electoral rolls as an ‘agent’. He may have been an agent for Shell, or a bicycle agent as my great-grandfather Gordy Moore described himself. It was common for bicycles to be hired out, so perhaps motor bikes were too in this period. Next is J. Deaz, astride the motor bike. There are very few instances of the surname Deaz in Australia so I think this probably should be Deas which is more common in the north east of Victoria. A George Henry Deas lived in Wangaratta around this time but his occupation was recorded on electoral rolls only as a labourer and there are no other clues to link the surname Deas to this location or occupation. There are a few candidates for W. McGuire but none quite fit the profile. If anyone has any ideas on who these last two men might be, please let me know. As can be seen from the image, Hickey’s garage was squeezed in between two double story buildings. 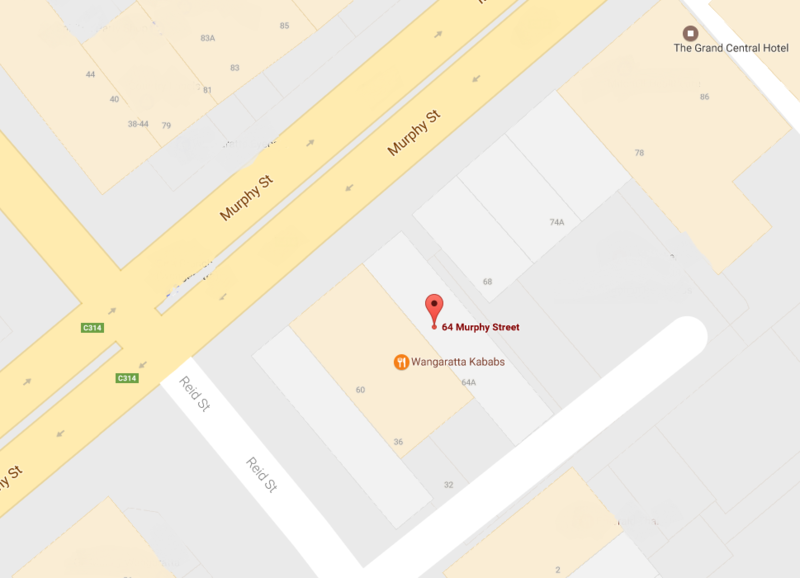 It was located at what is now 64 Murphy Street. The building on the right was Irving’s timber and hardware, known as the White Store, which took up three blocks from Reid Street. Irving’s Chambers now stands on the corner of Reid and Murphy Street where the original timber yard was. The building on the left of the garage was a chemist. Prior to 1923 it was owned by Mr Campbell, and before that Mr Hughes. The “chemist” sign can be seen in the image on the side of the building just under the “Hickey’s” sign. All three of these buildings – the chemist, Hickey’s Garage and Irving’s White House no longer exist. 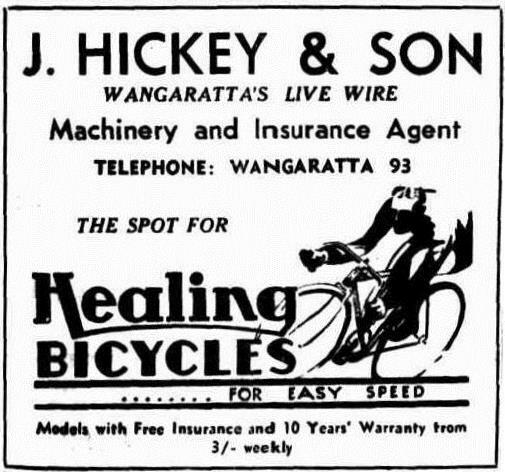 An advertisement for Hickey’s business in 1937 where the emphasis is on bicycles and the business is no longer also a garage. Sporting Globe, 27th January 1937, p. 11.